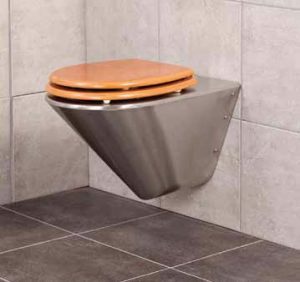 Stainless Steel wall hung toilet pan -Franke Model CMPX592 – is manufactured from Grade 304 (18/10) Stainless Steel, 360 x 550 x 350 mm. Unit to be a back entry or a top entry (please specify product codes provided). Unit to be supplied with 3 mm thick Stainless Steel wall fixing bracket and fitted in accordance with manufacturers specifications using 4 x 8 mm anchor bolts (elsewhere measured). Compliant with SABS 1733:1998 and SABS 497:1991 WC pan to flush with 4 and 6 litres of water. 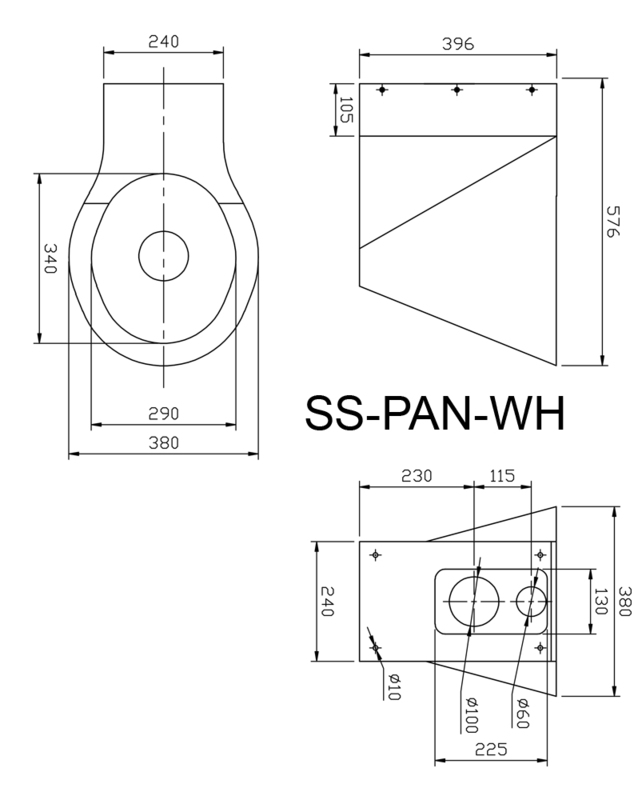 Pan to withstand point load of 400 kg as per international standards. Optional seat available (please specify product codes provided). Water conservation and quality assurance. Complies with SABS and LGA DIN EN International Standards. Description. Seats must be specified with pan. 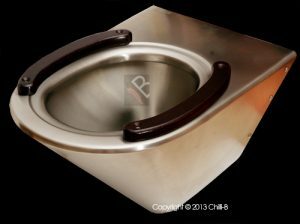 CMPX594 Stainless steel wall hung toilet pan for the disabled. Manufactured from Grade 304 (18/10) Stainless Steel, 360 x 700 x 350 mm. Unit to be a back entry or a top entry (please specify product code when requesting quotes). 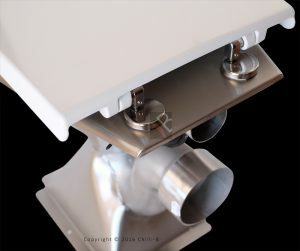 Unit to be supplied with 3 mm thick Stainless Steel wall fixing bracket and fitted in accordance with manufacturers specifications using 4 x 8 mm anchor bolts (measured separately). Compliant with SABS 1733:1998 and SABS 497:1991 WC pan to flush with 4 and 6 litres of water. 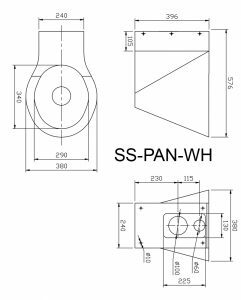 Pan to withstand point load of 400 kg as per international standards. Optional seat available (please specify code). 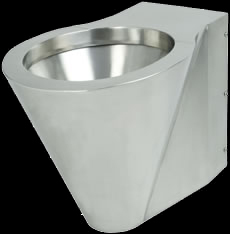 Back or top entry inlet to suit 38 mm flush pipe connection for a Flush Valve or Designed to fit onto a concealed flushing system. Water conservation and quality assurance. Complies with SABS and LGA DIN EN International Standards. Push button concealed Walcro 103, Walco 104 and Walcro 106 models. 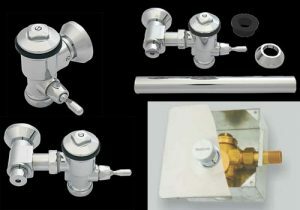 All three models are back entry and fit the CMPX594 back entry wall mounted pan. Duct installations: Use the Walcro 103LC- SS, Walcro 106C- SS or Walcro 104C- SS models. All are actuated with the VR push button. Boxed push button valve: Use the Walcro 107CHP 20 mm or Walcro 107CLP 25 mm models. Dalflux for WC exposed installation. 1” for wash down and wash out bowls for LOW PRESSURE flow. Pressure range from 0.5- 4.0 bar. Minimum static pressure of 1.5 bar. Minimum 1” supply pipe with flow rate adjustment and integrated vacuum breaker. Chrome plated brass. Product code: GR-37144000. 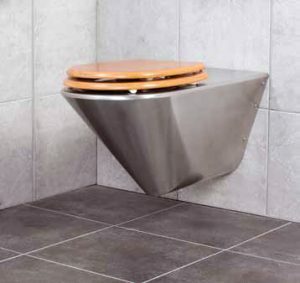 Standard stainless steel wall hung toilet pan. Made from 1.2mm thick grade 304 stainless steel. The outer body is made from one piece of stainless steel for hygiene and strength. The wall hung pan complies with paper removal test SABS 497:2:006. It also complies with flushing SABS flushing test: SABS:1733:2007. Use in wall flush valves or duct types. No seat supplied or holes drilled. If you do require a seat please specify when placing the order. The unit is fixed into a wall with 12mm anchor bolts (not supplied). A similar toilet is the SS-PAN-BW and can be found here.